Asian recipes offer dishes from many diverse favorite cuisines, from Japanese sushi to Thai curries. Let us celebrate Asian Food by cooking it at the comfort of our own home. Have some fun! available at some Japanese and Chinese grocery stores. large European and American cities. but as soft as an ear lobe. should be a little bit thicker than the edge. ingredients should equal the amount of meat. Do it as you like. 2. Put some salt on the cabbage, and let it stand for five minutes. Then press the water out of the cabbage pieces. sauce, sake, and sesame oil. Mix it all very well. filling should suffice for 30 gyoza pieces. semicircle, not all the way around. as shown on the image. 4. Put the gyoza on the table as shown in the image. 6. Keep the high heat and wait until all the water has vaporized. Then remove the gyoza from the heat. Eat gyoza pieces after dipping them in the dipping sauce. 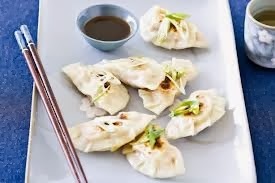 In China dumplins are usually eaten either steamed, fried or in a soup.